I had a long piece of 3/4 inch thick rough cut pine sitting around. It was in good shape with some wear to it, and a few nail and screw holes. It had been used as a wall board in a previous life and I wanted to make a pair of 3d stars with it. Before cutting I inspected it, pine is very knotty and I have found that the knots don’t work out so well when making stars. I cut it down into 5 12″x 10″ rectangles . I inspected them again and picked the 4 best rectangles and drew my star shape on each piece. I used a compass to draw a circle on the fifth piece. 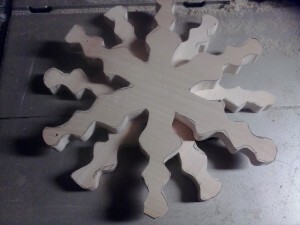 I cut each piece carefully on the scroll saw. I also cut out my circle. 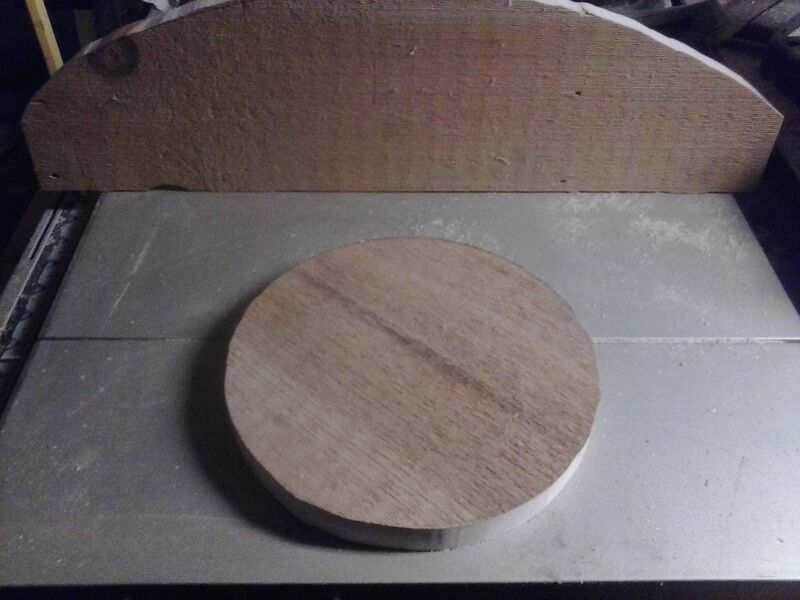 I will use the circle as the base to a pedestal table at some point in the future. I took a piece of 80 grit sand paper and sanded each star smooth. I will continue to sand to 220 grit, then I will apply a spray lacquer and attach two stars together to create a 3 d effect. For wall mount stars I will join the two stars with screws and add razor hangers to mount the star. For hanging stars I will use screws to attach the stars but I will use dowels to hide the drill holes and fishing line to hang the star. Behind the pine board I found some pine ship lap. it had a lot of damage on one side so I drew a curve to cut out the damage. I am going to use this for a sign. Due to the damaged wood the curve needs some help. I will use a rasp and a file to even out the edge. Now that there are clean edges it’s time to work on the surfaces. I will sand 3 times using 80 grit paper 150 grit paper and 220 grit paper. A quick spray with compressed air and a mineral spirits wipe down and the sign is ready for it’s close up. First I draw grid lines with a pencil. I will use those lines as a guide to write the text or draw an image. When the text is laid out I will take a box cutter and very gently trace the outline for each letter, this will ensure that I don’t hop out of the area to be carved. Sometimes instead of a box cutter I use a sharp chisel, occasionally I will use both. The box cutter blade handles curves well and the chisel is better along straight edges Now it’s time to carve. I use a dremel rotary tool, set at about 5 or 6, making several passes with the bit. I would rather have to go back and take out more than realize I took out too much. Now it’s time to use the wood burner. You can be as basic or as creative as you want but be safe. When I am happy with the carving I lightly sand away my grid marks, spray with compressed air, wipe with mineral spirits, apply stain if desired and finally apply a spray lacquer finish.. This entry was posted in process, repurposeing, scrap wood, wall art, wood working by brighid. Bookmark the permalink.